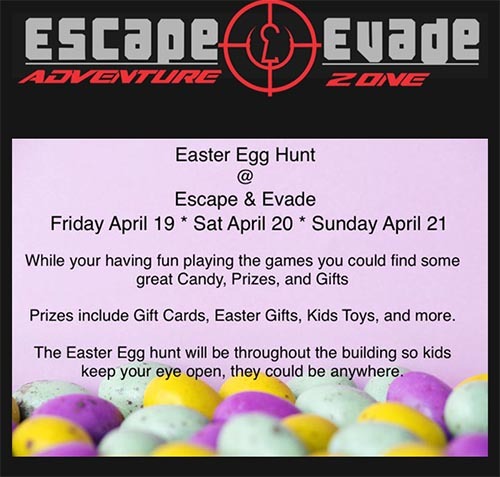 Description: Escape & Evade will be having a 3 day Easter Egg Hunt on Friday April 19th, Saturday April 20th and Sunday April 21st. That's right, 3 days of hunting those eggs. So kids while your playing those games and having fun in our attractions keep your eyes open for those eggs because you could find some good candy, prizes and gifts in them. Prizes include gift cards, Easter gifts, kids toys and more. Tickets/Signup: Use discount code CD20 when you book online to get 20% off your next purchase.